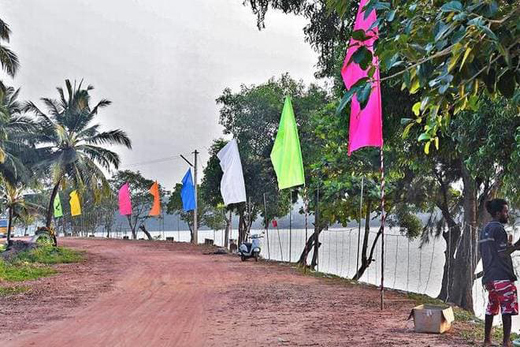 Mangaluru, Jan 11, 2019: The countdown has started for the first-of-its-kind two-day River Festival in the city that is endowed with two rivers on its flanks, from Saturday with the administration giving final touches for preparations. While the 23-acre government land on the banks of the Phalguni (Gurupura) at Bangra Kuloor would be the centre of attraction, hosting several events, including a film show on environment and river, the river stretch between Kuloor and Sulthan Bathery would be abuzz with boats of different sizes criss-crossing each other to ferry the revellers. Jetties for berthing the ferries are almost complete at Kuloor and Bangra Kuloor on the eastern bank of the Phalguni and at GMR Power on the western bank. A flee market too would be set up near Kuloor bridge. The Bangra Kuloor venue would also host a food festival where stalls would offer a host of delicacies, including local specialities. Various cultural programmes, including concerts and dances, will be held both at Bangra Kuloor and Sulthan Bathery venues. Special attraction would be performance of traditional and folk dances of the region on floating stages on the Phalguni on the days. Koraga dance, Dhapp dance etc., would add attractions to the event. Since the approach road to Bangra Kuloor venue is too narrow, people have to park vehicles at places such as Sulthan Bathery and Tannirbhavi Road, including GMR Power’s land, said Uday Shetty, Assistant Director of Tourism. While a jetty is provided at GMR to ferry people to Bangra Kuloor, bus facility too is being provided from GMR towards Bangra Kuloor via Kuloor, Mr. Shetty told The Hindu . Deputy Commissioner S. Sasikanth Senthil, who is keen on making the festival a success, intends to achieve many objectives through the event. One is to exploit the rich natural resources of the region to promote tourism; the other is to prevent deterioration of the riverfront abutting Mangaluru by increasing footfall on the riverfront and another one is to provide many open spaces to residents of Mangaluru who now have very few such places to relax. Condition of rivers has deteriorated over the years as residents have almost forgotten and stopped visiting them, mainly because of lack of riverfront facilities. Through the festival, the administration also intends to create some permanent infrastructure on the riverfront to keep people engaged with the rivers, Mr. Senthil told The Hindu .